This Pressure Cooker Moroccan Spiced Soup is full of delicious spices like cumin, cinnamon, paprika, ginger, and allspice. Pair that with lamb meat that melts in your mouth and chickpeas. That my friend is this beautiful soup. This post may contain affiliate links, please read my disclosure here. I love to travel. My hope is to one day travel around the world and eat the authentic cuisine of every single country I visit. Until I’m able to do that….I’ll bring the world into my kitchen. This Moroccan Spiced Soup has become a regular in our kitchen. It’s so easy and delicious that it has joined a few other soups that make a regular appearance, like this jerk chicken soup and this sausage and lentil soup recipe. 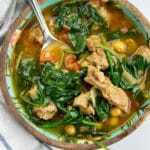 Moroccan Soup, also known as Harira, is made with either chickpeas and/or lentils, tomatoes, and meat. A lot of recipes you will find will leave the meat out. 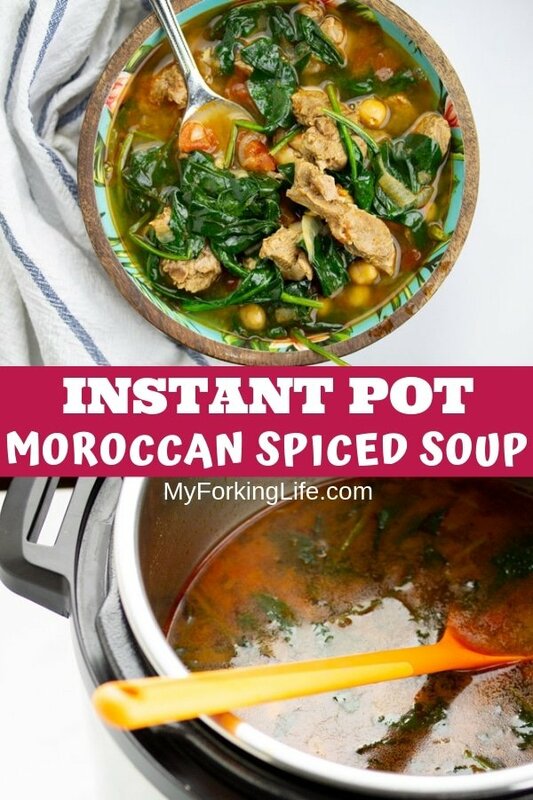 I’m a lover of meat and discovered that a traditional Moroccan Spice Soup will often contain lamb. So I made sure my soup recipe had it. You should be able to find lamb at your local grocer. I usually buy a leg of lamb and chop it into 1 inch pieces. I have the butcher remove the bone. 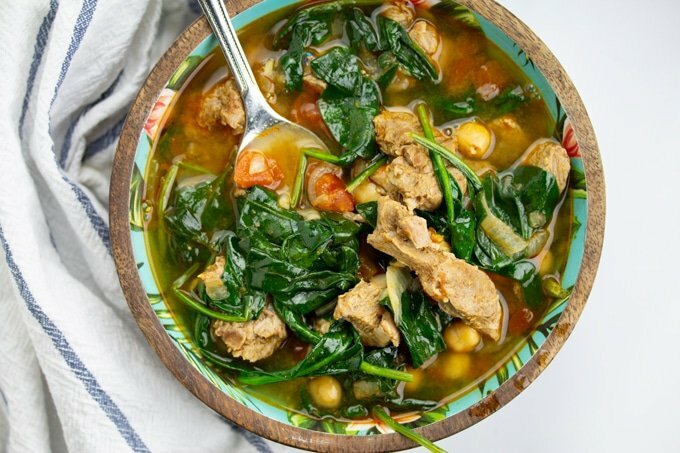 The addition of lamb is perfect for this pressure cooker soup because each bite of lamb literally melts in your mouth. That’s why the pressure cooker is amazing. 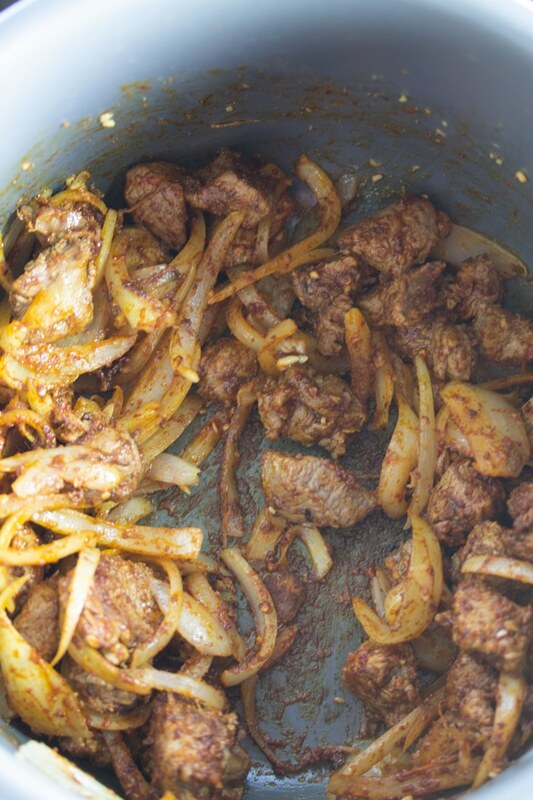 It’s perfect for cooking lamb and goat and getting them perfectly tender. 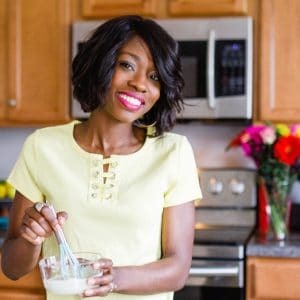 I make this soup (and almost all soups) in my Instant Pot Electric Pressure Cooker. First, set your pressure cooker to the high sauté setting and wait for your display to say “Hot.” Once it does, add your oil and then your chopped lamb meat. You’ll want to brown the meat for 4-5 minutes. 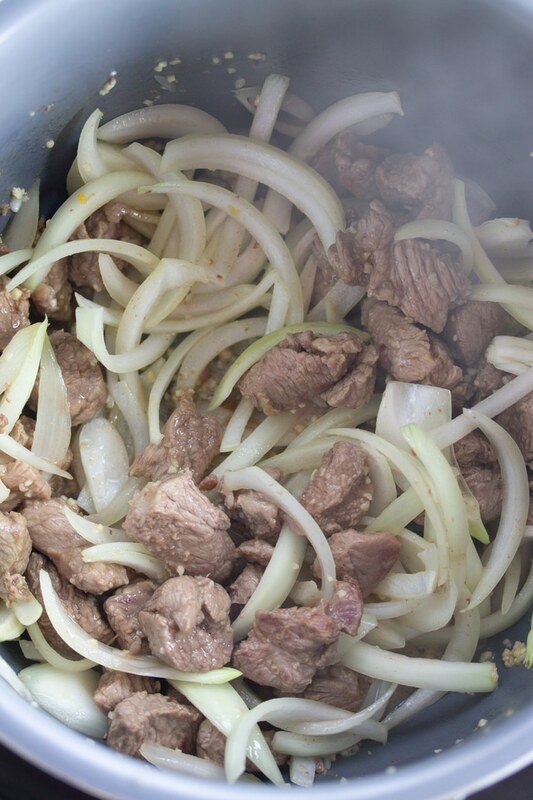 Next, you’ll want to add your onions and garlic and sauté until your onions have softened a bit, about 3 minutes. The moisture from the onion should provide enough liquid to get some of those brown bits at the bottom of the Instant Pot up as well. Removing those brown bits from the bottom of your Instant Pot is extremely important. 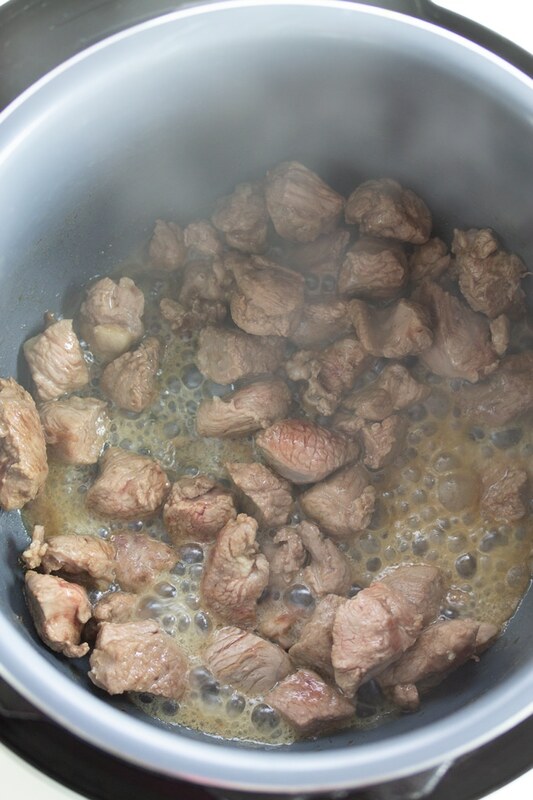 It should always be done after browning meats to allow you food to pressure cook properly. I recommend using a wooden spoon for this. Then add your spices and stir for about 1 minute. Next, add your chicken broth. Once you add your chicken broth, grab your wooden spoon and deglaze once more, making sure that all brown bits are removed from the bottom of the pot. Then you’ll add your drained chickpeas and diced tomatoes. Do not stir at this time. Rumor is that tomatos and tomatoes based producs could cause some Instant Pots to give off that dreaded burn signal. 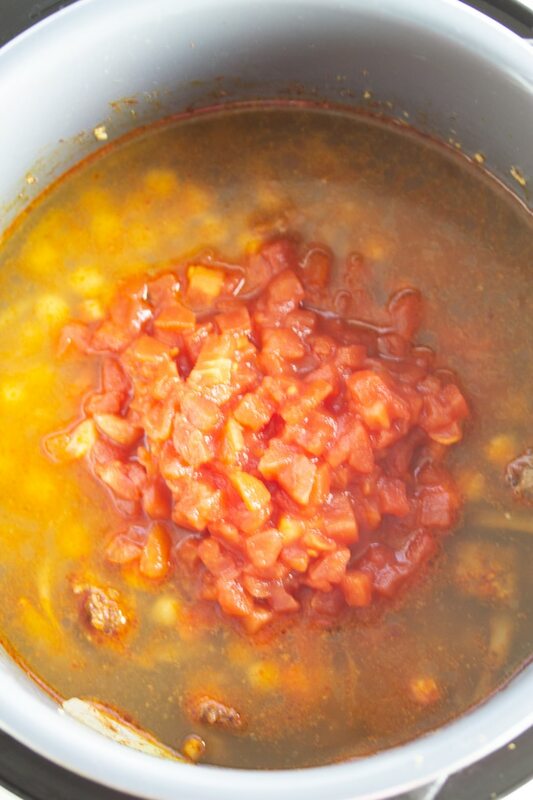 A way to avoid that is to layer tomato products on top and stir once the pressure cook cycle is complete. Cover and cook on high pressure for 20 minutes. It will take your pressure cooker about 10-15 minutes to reach pressure. Once the cook cycle is complete, allow the moroccan spiced soup to natural release for 10 minutes, then you may release the rest of the pressure. Once all your pressure is released, open the lid and smell the aroma…it’s delightful. 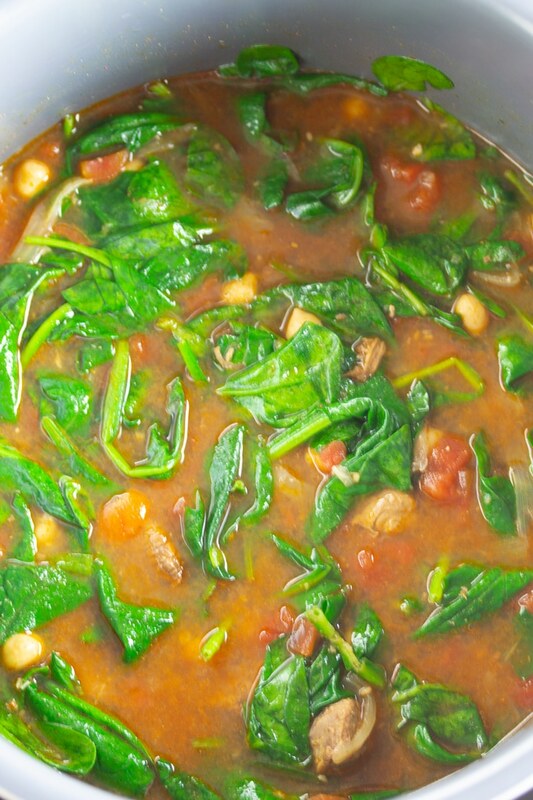 Stir in your spinach until all the spinach is fully submerged in the soup. If you’re new to the Instant Pot and are looking for a recipe perfect for beginners with step by step photos and instructions, try this Instant Pot Shrimp Paella. This Pressure Cooker Moroccan Spiced Soup is delicious, healthy, and a breeze to make in your Pressure Cooker. Press Sauté on your Pressure Cooker. Once Hot, add your vegetable oil. Then add your lamb meat and cook until browned, about 4 minutes. Add onion and garlic and stir until the onion has softened, about 3 minutes. Add cumin, paprika, ginger, cinnamon, allspice and stir for about 1 minute. Add chicken broth and use a wooden spoon to ensure that all brown bits are removed from the bottom of the pressure cooker. Add chickpeas and diced tomatoes. Do not stir. Cover Pressure Cooker and cook on high pressure for 20 minutes. Once pressure cooking cycle is complete, allow soup to natural release for 10 minutes, then quick release the remaining pressure. Stir in spinach and salt and pepper to desired taste. Have fun with the spices. Taste and adjust to your preference. You can omit the lamb if you want to make it Vegetarian or Vegan.